Ambassador Joseph DeTrani is shown in a file photo. North Korea recently released two Americans who were detained in North Korea on charges of “subverting the communist state” and “unruly behavior,” respectively, following Director of National Intelligence James Clapper’s secret visit to the country on Nov. 8. It’s not clear at this point what motivations drove Pyongyang to release the two Americans—Kenneth Bae and Matthew Todd Miller—while Washington said Clapper’s mission was simply to secure the freedom of the two Americans in his capacity as President Obama’s special envoy. Changsop Pyon of RFA’s Korean Service interviewed Amb. Joseph DeTrani , former U.S. Special Envoy for the Six-Party Talks (2003-2006), about his thoughts on Pyongyang’s intentions and its goal in releasing the two Americans. Amb. 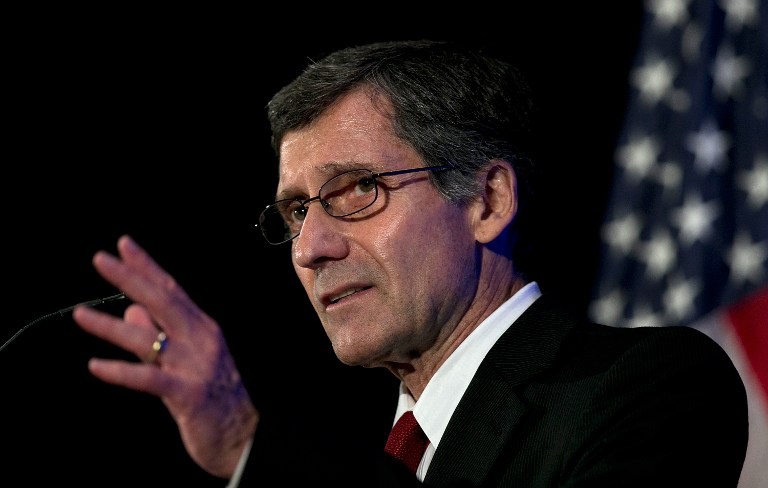 DeTrani, currently President of the nonprofit Intelligence and Security Alliance (INSA), also served as North Korea mission manager with the Office of the Director of National Intelligence (ODNI) from 2006 to2010 and its director of National Counter Proliferation Center (2010-2012). Q: North Korea invited Amb. Robert King, U.S. Special Envoy on North Korean Human Rights, to Pyongyang in February for the release of Kenneth Bae, but cancelled his visit at the last minute. Why do you think Pyongyang released the two Americans, including Mr. Bae, this time? A: Well, it’s very difficult to determine what, in this case, Kim Jung Un’s motivation was, but we have to look at things he’s done recently and then, based on that, we can make sort of an assessment as to what his real intentions were, and what he’s trying to accomplish. First of all, we know that for the last two and a half years North Korea’s policies have been a disaster. I mean, missile launches, nuclear test, threatening the U.S. and ROK with preemptive nuclear strikes, the brutal execution of his uncle, seizing four Americans and putting them in prison. These activities have engendered a lot of ill will, resulting in additional sanctions on North Korea, and certainly alienated their only ally, China. So, this is a series of actions the DPRK took over the last two to two and a half years. And this, in my view, has been a disaster. Then we look at what’s happened in the last month and a half. Kim Jong Un has sent his foreign minister to the U.N. for the first time in 15 years;. He sent Choe Ryong-hae and Vice Marshall Hwang Pyong-so to South Korea for the closing ceremony of Asian Games and also meetings with the prime minister and national security advisor in the ROK. He sent Kang Sok-ju to the European parliament and other states in Europe to talk about North Korea’s “peaceful intentions.” And now, there’s the release of Kenneth Bae and Matthew Todd Miller. This series of recent moves by North Korea shows that there is a good chance that people around Kim Jung Un are now saying “This is the right way to go, we need to build better relations.” And most importantly, there’s what’s happening on the human rights issue, which is a very profound issue. The United Nations is now talking about going to the International Criminal Court (ICC) and the possibility of indicting Kim Jung Un and senior leaders in Pyongyang, which has to be a very major concern of the North Korean leadership. So, you have a whole series of issues and actions on the part of the DPRK that speak to the fact that many in the DPRK realize that they have to change their behavior. They need to get out of the penalty box. They need to show they are a reasonable state actor that wants to engage and is prepared to come back to the Six-Party Talks. That’s sort of my analysis. Q: You just said that many in Pyongyang have realized the need to change their behavior. If that’s the case, why couldn’t they do so earlier? A: I think there are two reasons. One is they wanted a very senior U.S. government official [to visit]. Certainly Director Clapper is a senior U.S. government official. The other reason is this was a decision the president had to make, and he felt, in my view, that the best person for the mission was the Director of National Intelligence. Why not send somebody who has 16 intelligence agencies under him and who understands what’s going on in North Korea? So, President Obama decided to send the person who is most knowledgeable about North Korea and who meets the “senior” requirement. So, if they want to discuss missiles and their nuclear program, then Director Clapper is the man who can speak to the issues. Q: Mr. Clapper delivered a letter from President Obama to Kim Jong Un, but this only mentioned his role as presidential envoy and the purpose of the visit. What did they try to get from Mr. Clapper’s visit then? Was it simply some respect or a show of good will, for instance? A: I think you said it. They got a little good will. I think they got a better image as a more rational actor, one with a little more humanity and compassion. That’s all they got from something like this, I think. Q: Given Mr. Clapper’s very high rank, don’t you think North Korea might have wanted to use him as a sort of a messenger to deliver their views directly to President Obama? Q: In other words, Mr. Clapper didn’t go to Pyongyang to negotiate, right? A: Well, let me tell you this. The release of these Americans is a humanitarian move on the part of the DPRK. My personal view is that it’s not in their interest to hold these Americans as hostages, and it has nothing to do with the nuclear and missile strategic dialogue or negotiations with North Korea on their nuclear programs, illicit activities, and human rights. These are separate issues. The visit dealt strictly with the humanitarian release of the Americans. Q: If they had wanted some positive signal from Washington about the reopening of a dialogue, might this have been a big miscalculation after all? A: Yes. If they want a dialogue with the United States with the release, they have to be clear as to what that dialogue is about. If the dialogue is about implementing the Sept. 2005 Joint Statement, then yes, the U.S. would respond, in my personal view. But if you’re just talking about an exploratory meeting, I don’t think anybody wants to be there. We’ve been doing this for 20 years. So, I don’t think a meeting for the sake of meeting would generate any interest. Q: What might be the ultimate goal of Pyongyang on its nuclear issue at this point? A: What is their ultimate goal? Does that mean they’re prepared to denuclearize? No, we don’t know that. In fact, what we know is they want to retain their nuclear capability, which is something that we will never accept. So, if my analysis is correct, they realized they made a number of terrible mistakes and they are now trying to rectify their mistakes by showing good will so as to reengage with the international community—but certainly with the United States, the ROK, Japan, China, and Russia in the Six-Party process. So, what are their intentions? We don’t know. If North Korea wants to come back to the Six-Party process, we need to hear from them that they’re prepared to denuclearize in a comprehensive and verifiable way, as they agreed to in Sept. 2005. If they are not prepared to do that, what’s the point of going back to the talks? Q: Do you think that Pyongyang is well aware of the U.S. position on this? A: I think the North Koreans know that the U.S. position is reengagement with them. It is to reengage on the nuclear issues, and,not to renegotiate a new document. So, I think it’s pretty clear what the US objective is in this instance. If Director Clapper shared anything with the North, if he was confronted with anything, I am sure it’s in line with the U.S. position, that to talk with the North Koreans for any other reasons except the nuclear issue would be futile right now. The U.S. objective is to address the core issues of the nuclear and missile programs. And, then, obviously there are illicit activities and human rights issues, but those are bilateral issues, not Six-Party Talks issues. Q: By now Director Clapper must have fully briefed President Obama and others about his Pyongyang visit, right? A: I would assume he would be briefing the President of the United States and his national security advisors. Q: Do you see any possible effect of Mr. Clapper’s visit on the Obama administration’s stance on its North Korea policy in the coming days? A: I really don’t know, because I don’t know what was really shared with Director Clapper by the North Koreans. My sense here is that the U.S position has been very clear. The North Koreans might be sharing whatever they want, but what the people want to hear from the North Koreans is their willingness to come back to the negotiations for the dismantling of their nuclear programs.